This is a very belated Christmas present for my sister. 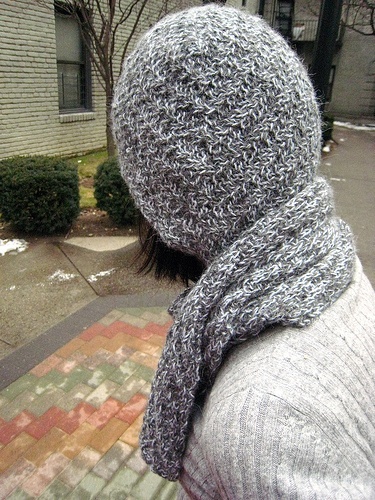 It’s kind of a knitted helmet-meshed with a scarf. The scarf is a diagonal rib (k2, p2, scooting over one stitch every right-side row) for two feet, and then I increased on one side only for about half a foot and then decreased on the same side for another half a foot so it would form that triangle shape to fit into the bottom of the hat. Then I knit for another two feet. Yarn: Joseph Galler Prime Alpaca (1 skein) and Frog Tree Fingerling Weight Alpaca (2 skeins) from The Yarn Tree, in Williamsburg, Brooklyn. Needles: No. 7 Addi bamboo circulars. I rarely hear people mention Addi bamboo needles, but I like them a lot. This is the only pair I have but they have a better cord than the Clovers, I think. Cost: Well, I bought 3 skeins of the fingerling weight but only needed 2. So, if you bought 1 of the Joseph Galler ($26.50) and 2 of the Frog Tree ($13), your total would be $39.50. I will evaluate the yarn and yarn store in another post. Cute! I think it looks like a chain mail hood.